Special tools with superabrasive cutting edge involve significant initial investments. The current trend is thus to develop multi-edge bars that make it possible to perform several operations simultaneously, shortening cycle times and drastically reducing the number of tool holders needed. 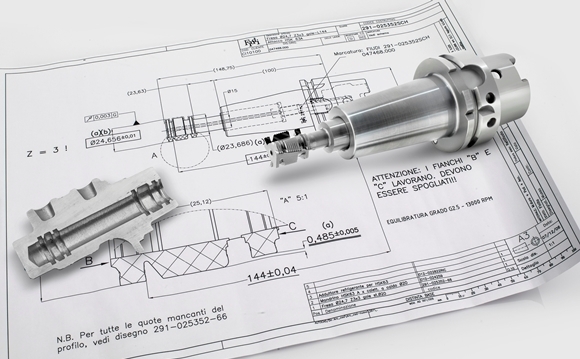 Working closely together with the customer, our engineering service is capable of developing process cycles and recommending the best operating parameters for available machine tools. Enormous advances have been made in superabrasive tools over the last decade, bringing substantial changes in basic tooling concepts. In particular, braze welded multi-edge superabrasive tools designed to extremely tight tolerances have superseded older adjustable mechanically retained inserts. In response to these advances, FIUDI has update its machinery to include 5-axis robotized CNC production systems, ultra-smooth finish profiling machines and process control/inspection system to guarantee that required tolerances are met. For complex products or process cycles that call for technical assistance during machine startup, our engineering service can provide all necessary support.